There are three different species of squirrels in the Twin Cities metro area. Red squirrels, gray squirrels and flying squirrels. Red and Gray squirrels are dayturnal and flying squirrels are nocturnal. In Minneapolis alone, there are thousands of them. Generally living and spending their days in trees enjoying the outdoors, just like the rest of us. All of us live in Minneapolis, St Paul or one of suburbs, and when it gets cold or stormy, we like to go inside, and squirrels are no different. 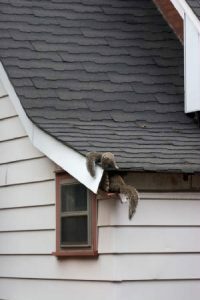 Squirrels sometimes will nest in your attic, wall space and chimneys, which you can hear as they run around. Squirrels will also chew on wiring, pipes, ducts, woodwork, basically anything, causing a lot of damage. Squirrels have TWO litters a year. One litter is born in early spring and the other liter in late summer. The average size litter is 3 to 5 young ones. That’s 6 to 10 baby squirrels a year! Squirrels have a bad chewing habit. They need to constantly chewing to keep their teeth short, and they love to chew on decks, siding, vents, wiring, ceilings and stud walls. 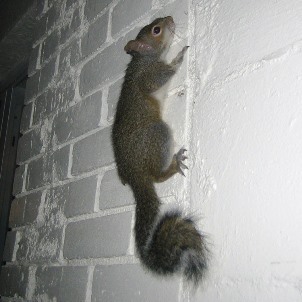 Squirrels can access unreachable areas. Your attic, soffits, fascia, walls and chimney’s depositing large quantities of feces and urine in your attic, walls cabinets. This can lead to structural damage as well as orders, flies, parasites. Squirrel removal is just the immediate issue and a lot can happen if you try to this yourself. Should I trap them, laydown poison or just scare them into leaving. Squirrel cleanup and sanitation will need to be done as well depending on the length of time the squirrel has been in your home. Squirrel Prevention: probably the most important. Prevent a squirrel from entering your home, or business the same way the last one got in.